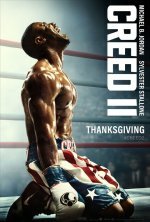 Creed II Movie PRIDE. LEGACY. FAMILY. 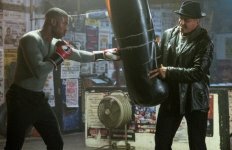 Creed II release date was Wednesday, November 21, 2018. This was a Nationwide in theaters release. Per Variety (1/5/16), it's not clear if Ryan Coogler, who is in negotiations for Marvel’s Black Panther, will return as director of the next Creed. Coogler and Stallone have already discussed sequel ideas. One version of the story would take place in the past (possibly with Carl Weathers to play Apollo Creed), or a linear story with Apollo’s son Adonis (Michael B. Jordan) taking on another challenger (Variety, 1/5/16). Rocky IV's antagonist, Russian boxer Ivan Drago, could factor into the plot of the next Creed film, per Sylvester Stallone (Instagram, 7/1/17). 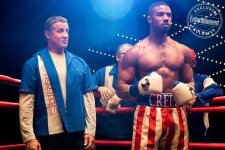 Creed II is the continuation of the Rocky saga and sequel to the 2015 critically acclaimed and crowd-pleasing 2015 hit Creed, which took in more than $170 million at the worldwide box office. "When I wrote and directed Creed, I wanted to tell a human story about a family from a new perspective, while also paying homage to the Rocky characters we've all grown up knowing and loving. I've known Steven was an amazing filmmaker since our days at USC film school together, so I can't wait to see what he, Sly, Mike and Tessa bring to this next chapter," said executive producer Ryan Coogler (4/2/18).